We all love our pets, but do we really know the best way to show that love? How many times have you given your pet a little snack, either when you leave, when you get home, or both? I know I am definitely guilty of giving too many treats. Remember the phrase, “The way to the heart is through the stomach?” People have taken that saying to heart, but is this really the best thing for our pets? The Association for Pet Obesity Prevention states that in 2017 “an estimated 60% of cats and 56% of dogs in the United States are overweight or obese” (Ward, 2018). This means approximately 50 million dogs and 56 million cats are heavier than their ideal weight. So, what can we do to help our pets lose the extra weight? First, we should think about how much we feed our pets. How many calories per day should your pet be eating, versus how many calories are they actually consuming daily? Unfortunately, this can be a very confusing topic for many pet parents. Many people do not know how many calories their pet needs to consume in a day. Dog food manufacturers give an approximate caloric intake on their packaging, however, that approximation is not appropriate for all pets. The recommended caloric intake listed on a dog food bag is normally tailored to active, intact, male dogs. Most of our pets are not intact and all have varying degrees of activity. The Association for Pet Obesity Prevention has a useful Daily Caloric Needs Chart for both dogs and cats (the chart can be found here). *Please contact your veterinarian or Pawsitive Steps for more information if you think your pet’s calories does not match up. do want to give your pet the occasional treat, that is okay to do, so long as it’s on an infrequent basis. Also, make sure when you do give treats that they make up for less than 10% of the total allotted calories per day for your pet. Another great way to help your pet win at weight loss is to get up and active! This is a fun way to pass the time and show love to your pet. A brief walk is an easy way to spend time together. You can also play fetch, tug-o-war or enroll your pet in training classes. If your pet has mobility limitations, you can try playing some brain games or even teach them a new trick (even old dogs certainly can learn new tricks). Looking for some new ways to get active with your pet? We can help! 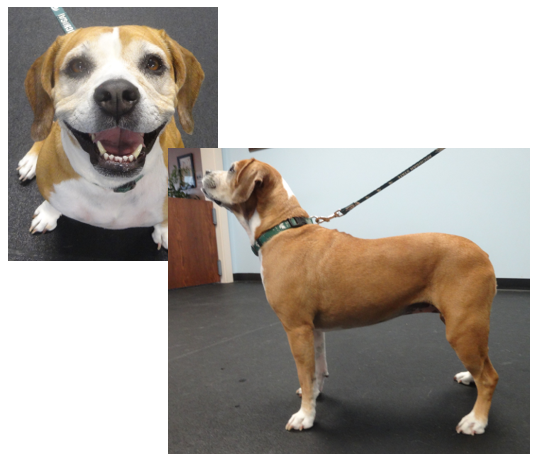 At Pawsitive Steps Rehabilitation and Sports Medicine, we can create individualized weight loss and fitness programs. Please remember to contact your veterinarian before starting any exercise or weight loss program, as there may be medical issues that need to be addressed first. Previous: What’s In A Pant?